Queen Beatrix who have reined the Netherlands for 39 long years voluntarily steps down in her son's favour. The ex queen assumes the title of Princess Beatrix. 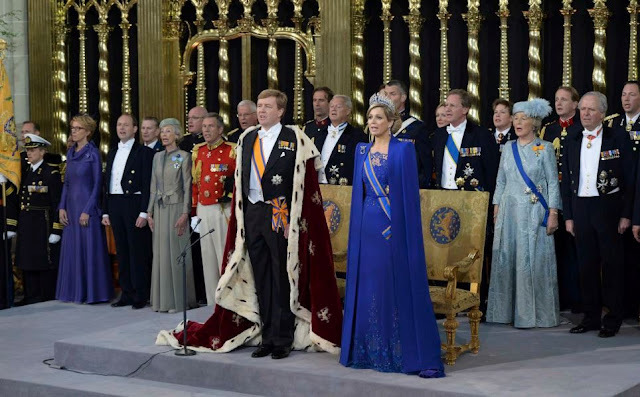 'I am happy and grateful to introduce to you your new king, Willem-Alexander,' she told the cheering crowd. The 46 years old Crown Prince Willem-Alexander has been inagurated as the first Dutch king since 1890. As King Willem-Alexander and his wife Queen Maxim took centre stage in Nieuwe Kerk, a decommissioned church, Princess Beatrix smiled happily, watching the proceedings with her three granddaughters, who all wore matching royal blue dresses, reports Daily Mail.